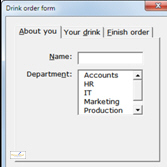 A TabStrip control, by contrast, is useless - for a TabStrip every "page" of the form contains the same boxes, so they can only be used to display records from a table. 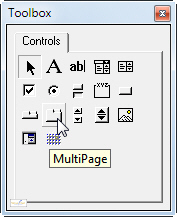 Make sure that you use the MultiPage (not the TabStrip) control! 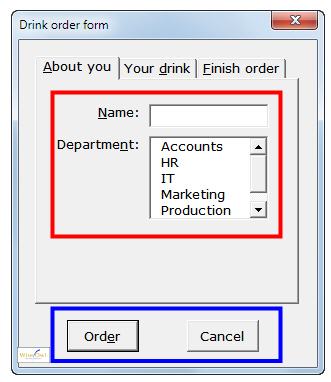 Click on the MultiPage tool, and click where you want it to go on your form. 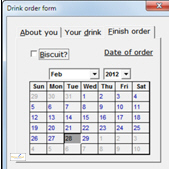 Right-click on the page tabs at the top of the control to add new pages or rename or move existing ones in a fairly obvious way. 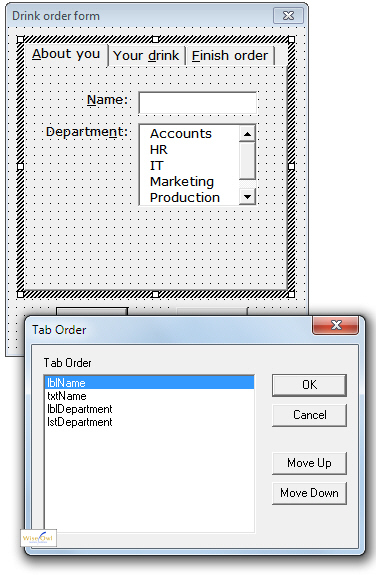 Here we're looking at the tab order for the About you page of the multipage control. The other pages will have their own tab orders. 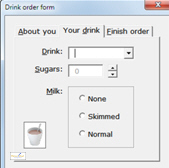 MsgBox "You must say who is ordering drink!" would crash the macro, because you can't go to a control which isn't on the active page of the MultiPage.